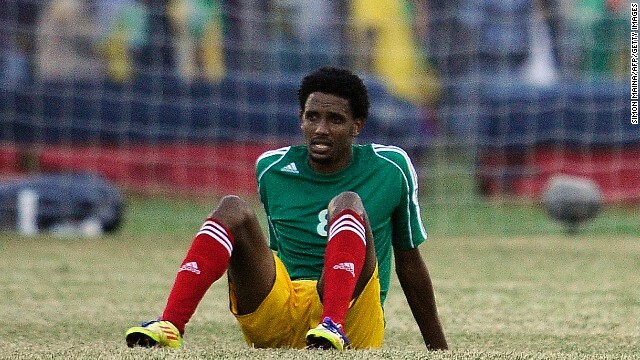 Ethiopia's Asrat Magersa shows his dejection after his team lost the first leg of the World Cup qualifier against Nigeria in Addis Ababa. (CNN) -- Ethiopia's hopes of making an unlikely appearance in the 2014 World Cup Finals suffered a major setback Sunday as a double from Emmanuel Emenike gave Nigeria a precious away victory in the first leg of their final African qualifier. Ethiopia have been the surprise team in the 10 remaining African national sides bidding for five places in Brazil and dominated against their more illustrious opponents for over an hour in Addis Ababa. But they let the Super Eagles off the hook through poor finishing, with Girma Adane wasting the best chance in the first half. After the break the pattern continued but in the 56th minute they did go ahead in unusual circumstances as Behailu Assefa's cross was caught by Vincent Enyeama, but the referee ruled it had crossed the line. But the Antelopes were unable to take advantage of their good fortune as Nigeria came more into the match. Victor Moses might have leveled after being put clean through but they were on level terms after Emenike's shot found its way past Jemal Tassew. In the final minute the home despair was complete as Aynalem Hailu gave away a penalty for a foul and Emenike converted from the spot. Nigeria will need just a home draw in the return leg in Calabar to book their place in Brazil next month. Cameroon are also well placed to join them, holding Tunisia to a goalless draw in the other key qualifier Sunday. They were indebted to goalkeeper Charles Itandj, who was kept busy and kept out good opportunities either side of the break. But Cameroon, with Samuel Eto'o starting after his brief international retirement, also had chances and Pierre Webo may rue his miss from only a few yards out which would have given them a cushion ahead of the return in Yaounde.